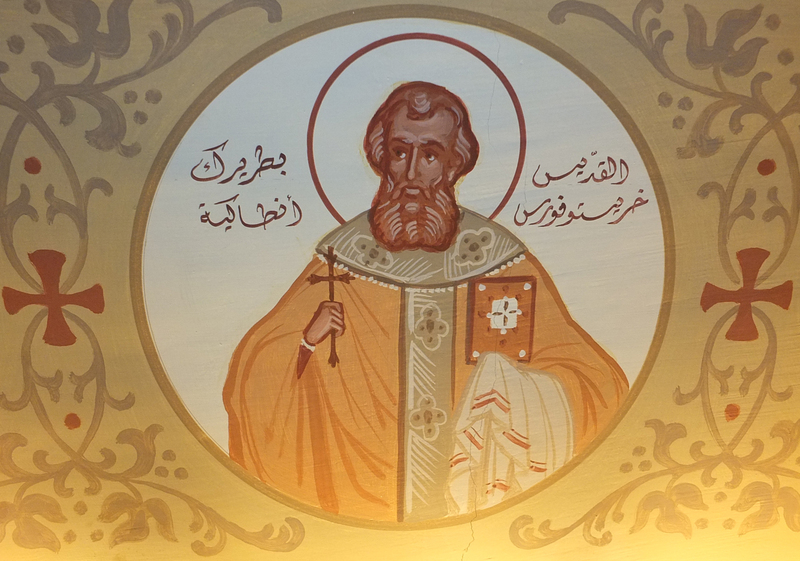 The future Patriarch Christopher was born in Baghdad to Orthodox parents who gave him the name Issa. As a young man, his penmanship and eloquence in Arabic made him a good candidate for the type of secretarial career that has often through history been the best path for advancement open to Christians in the Islamic world. So he went to Aleppo to seek his fortune at the court of the ruler Sayf al-Dawla. Sayf al-Dawla was himself most famous as the patron of the poet Al-Mutanabbi, who wrote many poems celebrating Sayf al-Dawla’s campaigns against the Romans. It seems that Sayf al-Dawla was sufficiently impressed with Issa’s abilities, and he made him secretary to one of his emirs, Caliph ibn Jundi, in the town of Shaizar, northwest of Hama. At this time — towards the end of the 950s — there was a conflict in the Church of Antioch over who should lead the community in the eastern parts of the caliphate. The institution for organizing the Church in the more far-flung parts of the Patriarchate of Antioch was called the catholicosate. In fact, the title Catholicos, as it is used by the heads of the Churches of Armenia and Georgia, is a vestige of these Churches’ original, usually nominal relationship to the Patriarchate of Antioch. A Catholicos was something like a Metropolitan of an autonomous Church. He would be part of the patriarchate’s holy synod, but he had considerable independence in overseeing his own metropolitans and bishops. Traditionally the catholicos had his see in Seleucia-Ctesiphon, the old capital of the Persian Empire, but following the Islamic conquest, the Orthodox catholicoi started living far-off in central Asia, in the town of Shash, or Romagyris, near modern Tashkent. As the Orthodox population of Baghdad began to grow beyond the settlement of Roman prisoners of war and the arrivals of migrants from other parts of the caliphate, they began to argue that the catholicos should reside in their city. After all, it was the capital of the caliphate, and not far from the Persian capital, whose seat the caliphate notionally held. Just as the dispute between the Baghdadis and the Central Asians was reaching its height, the catholicos in Shash died. As news of this spread, both sides saw this as their time to act. The people of Shash sent a delegation to Antioch to ask the Patriarchate to consecrate a new Catholicos for them, and the people of Baghdad decided to send a delegation to plead their own case. Who was better to lead the Baghdadi delegation than the eloquent, politically connected Issa? Before this could be resolved, however, the course of events was changed by another death. The Patriarch of Antioch, Agapios ibn al-ka’ Baroum, reposed, and the question of choosing a Catholicos was eclipsed by the need to choose a new Patriarch. At this time, and indeed through most of the history of the Patriarchate of Antioch, the task of selecting a new Patriarch was left up to the clergy and the people of Antioch, as the Patriarch was first and foremost the bishop of the city. The people of Antioch considered various names and possibilities, but they were most impressed with the piety and the ability of Issa. The leaders of the city then went to Sayf al-Dawla, who at the time was ruling Antioch, and he naturally approved of their choice of his protege. With little delay, Issa was ordained and then consecrated Patriarch, taking the name Christopher. Despite the fact that the new Patriarch had been a layman, and presumably a pretty well-off one at that, the author of his life emphasizes that from the very beginning of his patriarchate, he sought to live as an example of monastic piety and asceticism for his priests. During the week, he would rise early everyday to pray before dawn. He kept vigils every Saturday, from the evening until the Sunday morning Liturgy. He ate a simple, meatless monastic diet, and never ate before nightfall. His administrative wisdom was soon demonstrated in the way that he resolved the dispute between Baghdad and Shash that had originally occasioned his arrival. Even though he was, by all accounts, a proud son of Baghdad and had originally come to Antioch on behalf of his city, he chose to appoint two catholicoi: for Baghdad, he appointed a man from Aleppo, Nemaje, and for Shash a man from Antioch named Eutychios. He then set out to fill the many vacant sees of his patriarchate and to combat the rampant problem of simony and corruption among bishops and clergy. Under Islamic law, as you may know, Christians and Jews are required to pay a special head-tax, called the jizya, which, if they do not pay, they are forcibly converted to Islam. Up until Ottoman legal reforms in the 19th century, this would be a constant, pressing burden on poor Christians in the Middle East, and, indeed, it’s the single biggest historical factor for the conversion of most of the region to Islam. But Christopher used his good relations with Sayf al-Dawla to obtain a significant reduction in the jizya owed by the Orthodox. Not only this, but he arranged for the jizya owed by the poor to be paid by the Patriarchate’s coffers, so no one in Antioch was forced by hardship to convert to Islam under his patriarchate. In his life it also says that he also built two schools for training children for the Church. One was a smaller school for rich children, where they’d be trained in everything you need to know to serve the Church. The other was a larger school for poor children, that was financed by the smaller school for the wealthy. For this reason, and for the concern he had to personally serve the poor, among whom were often numbered his priests, in the story of his life he’s called a new Saint Nicholas. The prince then said, “Well, tell me then, what was the sin that touched upon your religion?” The Patriarch replied, “Before this it was a small sin that is easily remedied, but now it is great and cannot be pardoned, since it is not permitted for a priest to seek the intercession of you, a Muslim, in matters that pertain to the Church alone.” The prince became angry and told the patriarch, “Be forewarned! Know that you will die, because I will take your head off, even if it’s resting in Sayf al-Dawla’s lap.” But Christopher was not afraid of him. Towards the end of the 960s, Syria and Palestine are falling into political, economic, and social chaos. The constellation of many statelets ruled by local strong-men like Sayf al-Dawla who owed nominal loyalty to the Abbasid caliph in Baghdad, who by then was powerless, were no longer strong enough to defend themselves. Egypt and Palestine were soon to be conquered by the Ismaili Shia Fatimid caliphate, and Roman armies under Emperor Nikephoros Phokas were steadily moving eastward, retaking Cilicia and Tarsus and then Cyprus in 966. At this point, the situation in Antioch had grown tense. The city was filled with refugees caused by the famine caused by the Roman invasion. The Romans’ favorite tactic was destroying cropland and laying siege. Sayf al-Dawla’s health was deteriorating, so his lieutenants began to plot against him. Christopher, however, would have none of this. Fearful that he would be implicated in the plot, and unwilling to be disloyal to his patron, he fled to the Monastery of Saint Symeon the Stylite near Aleppo, and he decided to remain there until everything blew over. One of the monks approached him and asked him how could he call himself a good shepherd if he’s abandoning his flock this way, and he simply said, “You don’t know what I know,” and left it at that. This is highly unusual. As it turns out, Sayf al-Dawla was not so weak as the plotters had thought, and he came to Aleppo and had them killed. This displeased a lot of people, and this displeased a lot of people with Christopher for his apparent willingness to side with Sayf al-Dawla. So people began to plot against him specifically. He became aware of this, and realized who was behind it and then invited them to eat with him. While at this meeting on May 22 in 967, he was killed by having a javelin thrust into his chest. At least as the way the life portrays this, he attended this with the knowledge that he would be killed in order that nothing affect the rest of the Orthodox community in the city, which presumably was the case. Another source says he was killed by Khorasanians in the home of Ibn Manik, an Arab he had rescued from prison, due to being accused of having secret dealings with Emperor Nikephoros.. When Christopher was killed his body was thrown into the Orontes, from whence the Christians obtained it eight days later for burial. The body of Patriarch Christopher was first buried in a monastery outside Antioch, and then later it was moved into, during the period of Roman rule, the House of Saint Peter, which was the major shrine in Antioch at that time. His life, written by a disciple of his named Ibrahim ibn Yuhanna, was himself a prolific translator of patristic texts from Greek into Arabic. He is responsible for the translations of the orations of Gregory the Theologian into Arabic from Greek. Other spiritual children of the Saint were also prolific translators.